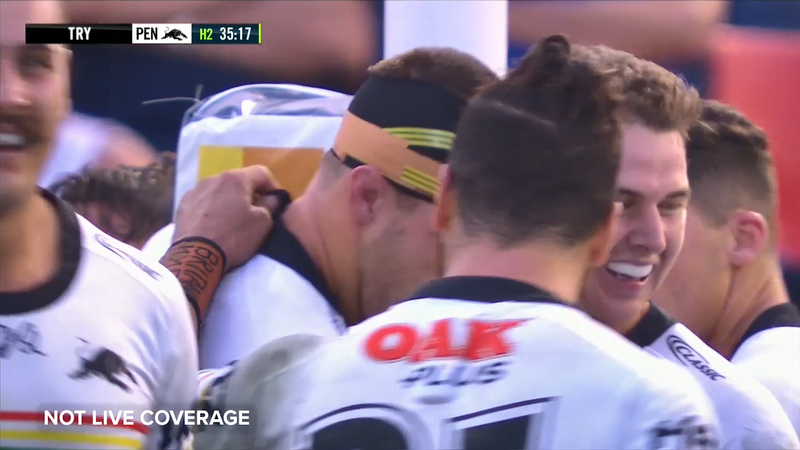 A controversial decision to let Panthers forward Isaah Yeo out on the field after suffering what looked like his second concussion in two weeks has actually paid off for Penrith in their 16-14 win over Newcastle. Yeo was shaky on his feet to say the least after struggling to get off the ground after the accidental blow to his head. It was reported Yeo had failed his head injury assessment after failing to get back after 15 minutes according to Fox Sports commentator Andy Raymond, however club doctors cleared him to return. And the Panthers were glad they did, with the club's co-captain dragging five defenders over the line to score a crucial try that gave the Penrith side some breathing space and ended up being the match-winning try. Fox Sports commentator Braith Anasta said he was surprised to see Yeo back out on the field after a heavy knock. Maroons coach Kevin Walters agreed Yeo looked dusty but said he had faith in the Penrith club to make the right decision in regards to the player's health and that he must have been fit enough to go back on the field under the direction of the club's doctors. The Panthers were also best served by James Maloney, who produced two inspiring defensive plays to inspire Penrith. Maloney has been chastised for most of his career over his defensive blues. But the 32-year-old came up with the goods when his team needed it most, beginning with a second-half bellringer on Connor Watson to force a turnover. And while it may not have resulted in points, moments later the veteran prevented Edrick Lee from a near-certain try when he stripped the winger over the line. A Mitch Barnett rampage with seven minutes to play set up a grandstand finish, but the Panthers held on to secure their first win of the season. Maloney was also involved in two of Penrith's three tries in an all-round display. One week after getting caned in the penalty count in their season-opening loss to Parramatta, it appeared Penrith's ill-discipline would cost them again. They were pinged 5-1 in the opening 13 minutes and were down 2-0. But Ivan Cleary's side slowly regained their footing to claim the lead on a well-executed set play for James Fisher-Harris. And while Kalyn Ponga got one back on his cutout pass for Lee, the Panthers entered the break in front on Malakai Watene-Zelezniak's miracle effort. The Panthers winger tapped back a Nathan Cleary grubber well over the deadball line for club debutant Frank Winterstein to ground. Both sides had opportunities to seize the initiative, including chances for Ponga and Waqa Blake, in an enthralling second half contest.